This is not a post anyone would look forward to write, especially this close to Christmas. It wasn’t the post I had scheduled for today. However, it’s one I felt I had to make. I tend to be part of three communities. My connection to the reviewing community has waned in recent years but I still maintain friendships from there. My focus has been on the comics community, tumultuous as certain parts of it has been lately, since that ties into my goals. However, blogging was my first connection to the internet outside of the Transformers community, which I’ve also lost ties to, and today the old comics blogosphere has suffered a huge lost. Reports on Twitter are that Brian Snell of Slay Monstrobot Of The Deep passed away over the weekend. I don’t have access to a picture of him, so forgive me for using the above panel for the RIP picture. It’s from the comic panel that the site gets its name from. The report comes from Facebook, where I admittedly don’t follow him so I’m going on reports from others. However, I have no reason to believe that he would lie about it, even if I didn’t see the post there myself since I’m not one of his Facebook friends. Even as I write this new posts, likes, and retweets are coming out as those who enjoyed his site struggle to deal with the news. I haven’t followed social media much as of late (since 2016 to be exact since I’ve either been sick, recovering, or catching up with stuff as well as other life issues) so I didn’t even know he was sick. As I write this no cause of death has been reported so I don’t know what exactly happened. But I do know what he left behind. I'm not sure I know how to process this. Sad and unexpected. In many ways, he was my other self in the blogosphere, one of the most supportive bloggers out there, and I loved reading his stuff. Brian and I weren’t best buds or anything. We were friends as much as anyone who was part of the same blogging circle and Friday Night Fight participants were though. More importantly, if you’ve read this site long enough you’ve heard me talk about 2008 and my first multihosptial stay, the one that didn’t require surgery. During that time stuck home I came across a series of blogs: Comics Should Be Fun, Comic Coverage, Siskoid’s Blog Of Geekery, and Slay Monstrobot Of The Deep. It was in replying to these and a few other blogs that I found myself writing numerous paragraphs in the comments to the degree that I found it easier to start my own blog. So these four blogs are indirectly responsible for the creation of BW Media Spotlight. I wonder if they regret that? I’m stunned by this — it just doesn’t seem real. When I first entered the online comics community, Snell was one of the first people to support my stuttering efforts, and his friendship, his kinship, never faltered. His energy, his love of obscure characters, was an inspiration. Sorry, I need a little levity here because this is kind of tough. In fact, he and Siskoid link to this site and I’ve seen incoming readers having come from his site, and he often replied to tweets and articles so I know he liked at least something I was doing as much as I enjoyed his articles and feedback. This the third person of importance to me I’ve lost this year. It may not be as bad as losing actual family members but it is losing a friend and one of my inspirations. And I’m not alone according to some of the tweets I’m reading. Brian Snell wasn’t just a blogger, he was supportive of the community. He’s replied to article on this site and many others, both in the case of Friday Night Fights and otherwise. His site’s own tagline sets up his mission statement. It wasn’t his only blog. He also has blogs dedicated to James Bond and Sherlock Holmes. However, it was this comic blog that received the most attention. The title comes from the above scene, appearing in issue #75 of Master Of Kung-Fu, in which the villain sends a giant talking monster against the titular hero, Shang-Chi. Because of course he fought half-sized kaiju. Dude’s fought Doctor Doom and a giant turtle before. Comics can be crazy. We also shared a belief that the Vision is underrated at Marvel. Most of the site and his twitter feed are dedicated to how fun old comics were and still are. He was in the middle of a series chronicling the insanity of the original Kid Eternity comics and some of the odd historical figures and fictional characters he would bring from the afterlife to help save people and fight bad guys. This was a rough thing to wake up to. Snell was one of those constants of online life, and he will be missed. Brian also unintentionally inspired that Ninja Ballerina comic I want to finally get through. In an article about a doll called Nina Ballerina that was being advertised in of all things an old war comic, he wrote that if they added a “j” it would have been a great toy idea. I responded that it sounded like something now extinct web comic site “Action Age” would create, but the idea just kept rolling around in my head and I soon formed the story I’ve mentioned, about a ballerina who fantasizes adventures her Asian roommate in the traveling ballet troupe (it will be less racist-sounding in the actual story, but our narrator’s a bit of a bubblehead) has as a ninja crimefighter. If I don’t end up dedicating this comic to him when I finally finish it, someone yell at me! I just wish he was able to see the disaster he unleashed in my brain. Oh my gosh. He was a daily part of my life, bringing smiles and laughter at times when those were not always plentiful. I will miss him greatly. I’m not sure what else I can say. I haven’t been on social media much lately, and I haven’t even always had time to keep up with blogs, even the ones that inspired me. But I’ll miss his articles, our conversations, and the positive influence he had on this community. Who knows how many article he pre-scheduled, which means even after his passing he’ll still be leaving his love of comics behind for everyone else to find, and hopefully one of them will steer the big two out of the madness that inspired him and bring fun comics back. Farewell, Brian “Disco” Snell. Hopefully Kid Eternity can let you visit us one of these days. Also, please say a prayer (or whatever your equivalent is) for his family. He had a wife and I believe at least one child plus I don’t know how many other relatives and close friends. It’s tough enough to lose someone you love, but days away from Christmas is even worse. He was a real inspiration when I was blogging. He managed to get it so perfect, so consistently, and so often. As a teacher, comic fan… And a human being Snell was a person who I looked forward to interacting with. Wether it was online or reading his stuff he was always inspirational. Too many responses to pick one. Slay Monstrobot Of The Deep is one of the sites that led me to become a blogger. We also had some good chats online. I feel sorry for his family most of all. 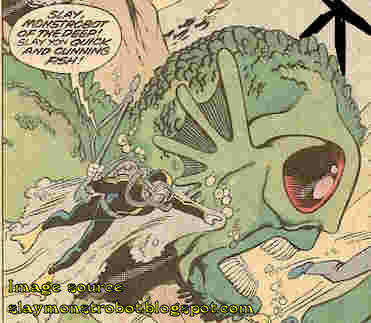 Posted by ShadowWing Tronix on December 19, 2018 in Comic Spotlight, Internet Spotlight and tagged blogging, Brian Snell, Death, Slay Monstrobot Of The Deep.